New York cops with ropes and ladders scaled up a portion of the Statue of Liberty on Wednesday for a dramatic July 4th capture of a female protester who hoisted herself up the robes of the statue to call attention on U.S. treatment of migrant families. The Statue of Liberty was closed while police tried to talk the woman down. 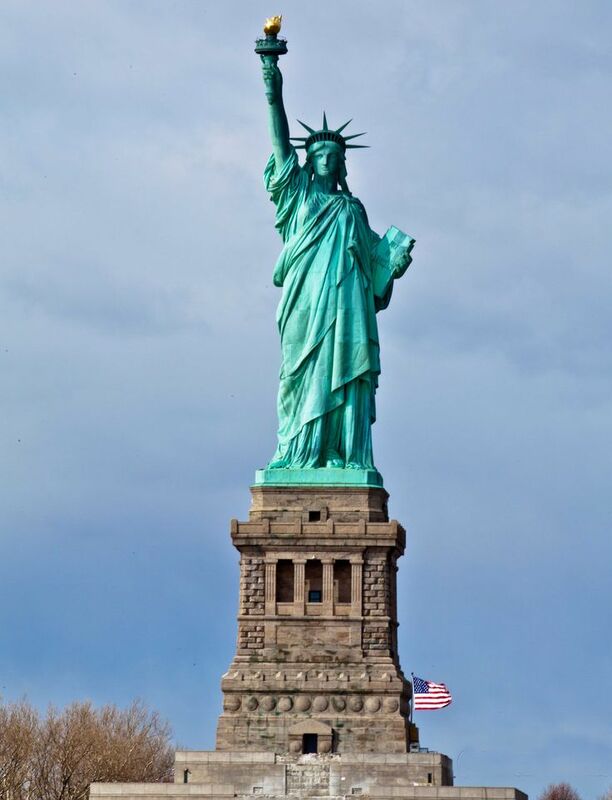 Television footage showed the woman traversing the base of the statue and sitting in the folds of the statue's dress and under Lady Liberty's sandal. Earlier in the day, seven protesters unfurled a banner reading "Abolish I.C.E." at the statue, prompting officials to close the national monument to tourists. Jerry Willis, a spokesman with the National Park Service, told USA TODAY that the climber was still sitting on the base of the statue and talking to police as of the early evening Wednesday. She was taken into custody with no apparent injuries after about a four-hour standoff. The Associated Press, citing an unnamed federal official, said the woman told police she was protesting the separation of immigrant children from parents who cross the U.S.-Mexico border illegally. Willis said the national monument was closed Wednesday out of "an abundance of caution" after the events. As of 4:30 p.m., tourists were being loaded on boats off the island and no new boats were headed for the island, he said. "We've had two unusual events occur back-to-back," Willis told WABC News in New York. "So for the safety and security of our visitors, we decided to evacuate for the day . . . It's our busiest week of the year, historically. The island at this time of the day is mostly near capacity, at 4,000 to 4,500 people. All boats have been tasked with moving people off the island. Given the heat of the day, the visitors complied with no issues." The activist group behind the banner, Rise and Resist, tweeted that the climber wasn’t connected to its demonstration and expressed concern for the climber’s safety. The New York-based group opposes President Donald Trump’s administration and advocates ending deportations and family separations at the U.S.-Mexico border. The seven protesters received summonses to appear in federal court, Willis said. Federal code of regulations prohibits hanging banners from the monument, Willis told The Associated Press. Rise and Resist said in a release that they hung the banner to protest U.S. immigration policy. In a tweet, the group said they oppose the Trump administration and advocate ending deportations as well as family separations at the border. ICE stands for Immigration and Customs Enforcement, a division of the Department of Homeland Security. Among other duties, its officers arrest and deport unauthorized immigrants inside the U.S. The protest group in Wednesday's incident said that the woman who climbed the statue took part in unfurling a banner at the statue’s pedestal, calling for abolishing the federal government’s chief immigration enforcement agency. But the group says no one else was aware she would climb the base. Protests and evacuations at the Statue of Liberty are rare. In February 2017, someone hung a banner reading “Refugees Welcome” from the observation deck. The sign was taken down about an hour after being discovered. A year earlier, a West Virginia man with psychological problems was sentenced to time served after calling in a bomb threat. His call forced the evacuation of Liberty Island, sending 3,200 people on boats back to Lower Manhattan and New Jersey. The statue, a gift from France, was dedicated in 1886. It became a welcoming symbol for immigrants and refugees coming to the U.S.